Columbine Smille, before Christopher Kane, London, February 2012. Slip on a pair of booties (add tights for the depths of winter): RED Valentino high heeled booties with bow, 3.1 Phillip Lim Delia booties, ASOS Tornado shoe boots or Marc by Marc Jacobs shiny happy sequin booties! Okay. Love the denim. I would not have thought to distress this particular shape and length and wear with heels, but it's nothing short of brilliant. so casual yet so chic! 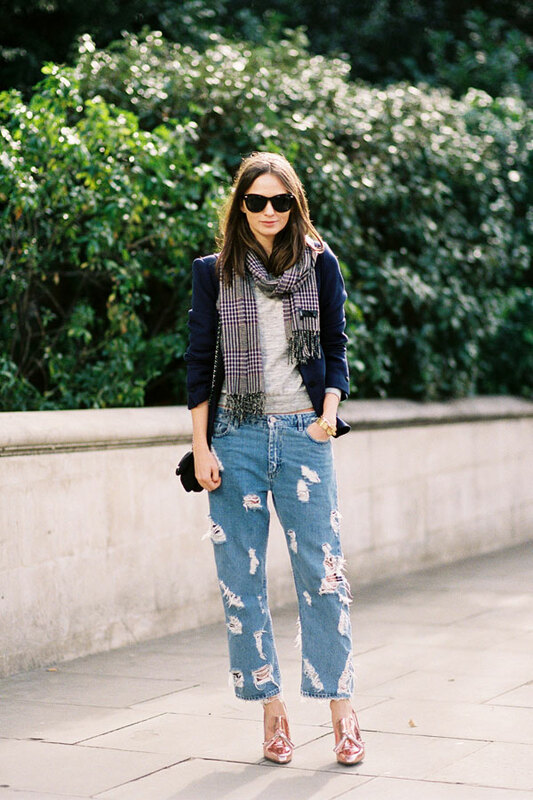 Everything looks pulled together well, from the torn jeans to the classic herringbone scarf. @Ginger - I think they might be the Acne pop trash jeans??? But I could be wrong! @Dominika, @monkeyshines - it is a cute look, isn't it and if you didn't like distressed jeans (and lets face it, not everyone feels comfortable walking around with holes in their jeans!) you could just wear "normal" jeans.